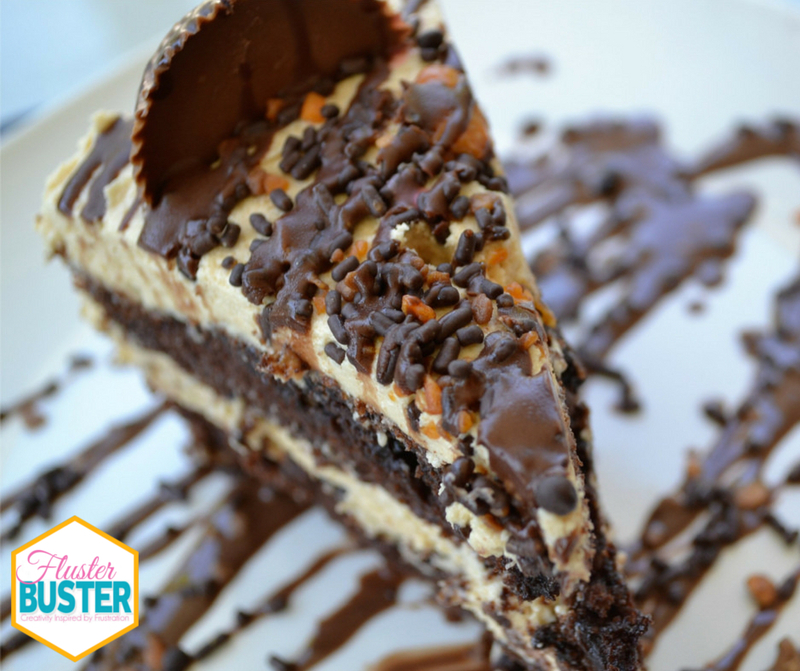 Reese’s lovers, have I got something for you, Reese’s Layered Brownie. A not-to-sweet peanut butter buttercream frosting sandwiched between two layers of dense fudge brownies and topped with crushed candy, nuts, chocolate and of course, Reese’s Peanut Butter Cups. 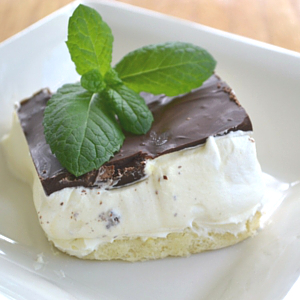 This will quickly top your list of favorite desserts. Birthday’s are a pretty big deal around our house. For a whole week the person who is celebrating is treated like a king/queen. One of the birthday perks is choosing the type of birthday cake that they want. When the kids were little they usually chose cakes from the bakery, they liked cakes that were decorated with the current fads. Now that they are getting a little older it’s more about the flavor than it is about the decorations. My youngest M.I.T. (man in training) just celebrated his birthday week and when asked what kind of a cake that he wanted, I was expecting him to choose what he always chooses. He’s my predictable child, who doesn’t really like change. To my surprise he chose something different then he had from years past. He challenged me to make a cake with chocolate and peanut butter. With a little experimenting and some creativity he was presented with a cake that has become a favorite with everyone who had a slice. 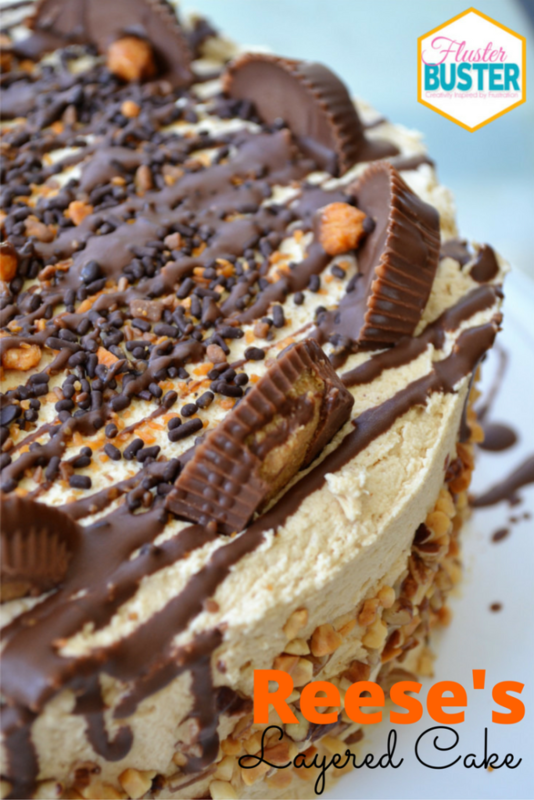 A not-to-sweet peanut butter buttercream frosting sandwiched between two layers of dense fudge brownies and topped with crushed candy, nuts, chocolate and of course, Reese's Peanut Butter Cups. Prepare brownies according to package directions. Divide batter into 2 8-inch round cake pans. Cool brownies on a cooling rack. When completely cool, refrigerate for 1 hour before frosting. On medium speed, cream together butter and shortening. Add peanut butter, vanilla and salt, continue mixing until combined. 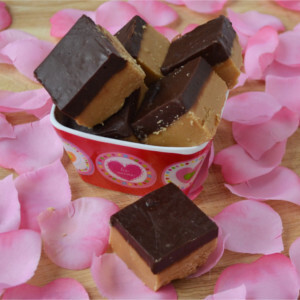 Gradually add sugar, one cup at a time, scraping the sides of the bowl often. The frosting will be a little dry, add milk 1 tablespoon at a time until the frosting is light and fluffy. Frost the layers of the brownies, using a generous amount on the top and sides. Sprinkle Butterfinger crunch on the top, add Reese's halves and stream Reese's hard shell over the top. I couldn’t be more thrilled with how this cake turned out. Everyone who was at the party raved about how pretty it was and how delicious it tasted. I posted a picture of the cake on Instagram and my work buddies gave me a really hard time when I didn’t show up with the leftovers. If there had been any I would have shared. **Don’t tell but I just made another cake that I’m going to bring to work tomorrow. I’ll let you know if it’s a hit or not. It tastes even better than it looks! It quickly became a favorite in our house. Sorry, I tried really hard to make it without calories, but I didn’t have much luck. I love those brownies in anything. Thanks for sharing at What’d You Do This Weekend. This looks sinfully good! Pinned. I can’t wait to try it. Wowzers! This cake looks divine! 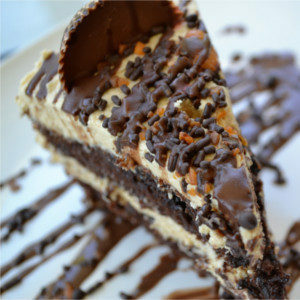 I love Reese’s anything… I could go for some of this cake right now! Thanks for sharing at my Creative Ways Link Party! You’re one of the features at this week’s party!